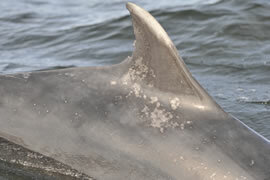 "Sooty" (ID#015) photographed in 2009. 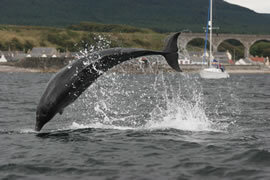 A breaching bottlenose dolphin in Cullen Bay. The CRRU research team at work. provide information essential for the development and implementation of effective conservation strategies to protect these animals and their habitats. As long-lived mammals with low reproductive rates, clear assessments of the status of these animals require long-term and ongoing research studies, and in this respect the current objectives of the CRRU’s research activities form part of an annual monitoring program. Ongoing studies will allow the CRRU to focus conservation measures in relation to human activities in this area (e.g. 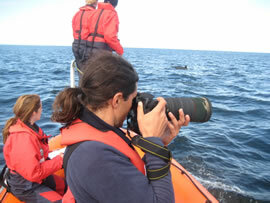 by-catch reduction, disturbance by shipping, tourism etc); identify times and areas of special significance in the life cycle of these animals, such as breeding periods and nursery areas for example; and to measure the effectiveness of current management and action plans, assisting in their future development. 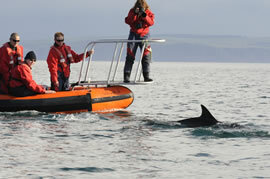 Current studies aim to achieve additional coverage of the outer Moray Firth region, integrating broader scale survey data and directing more detailed work in focal areas of particular interest or concern. These objectives will be fundamental to local management directives for the protection of this and other UK coastal cetacean communities. For a full publication list of research papers and reports by the CRRU, click HERE.